I have danced since I was young and trained in performing arts at collage; since 2005 I have worked professionally in this field. 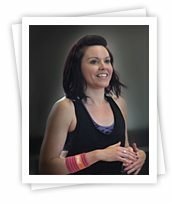 When I moved to Manchester from the Midlands in 2011 I needed another job and decided to become a Zumba Instructor; I had been a participant in many classes and I was hooked. After dancing for so many years Zumba seemed the perfect way to make extra money and get fit at the same time, it turned out to be so much more. HFE were recommended to me by a friend. Some of the other Zumba instructors I’d spoken to about doing my Level 2 Exercise To Music had trained with HFE, so it seemed like the right thing to do. Once I had spoken to Yvette my mind was made up, I was very excited about starting my training course after she told everything i needed to know about it. The practical weekends were the highlight of the course. The tutors, students and content all made for a fun, enjoyable learning experience. After the practical weekend everything clicked into place, I’ve always learnt better from being shown something, so for me this was the perfect. I was truly inspired by the Tutors during both practical weekends, they taught us in a fun but thorough way, which made complete sense. The practical weekends were the highlight of the course. The tutors, students and content all made for a fun, enjoyable learning experience. As I mentioned before I’m a Zumba Instructor and I’m lucky enough to teach in some amazing fitness facilities around south Manchester and Stockport. As well as Zumba I teach Dance fitness classes and since passing my Exercise To Music I have qualified as an Aqua instructor. I get so much enjoyment from my job, and feel I’ve been very lucky with the opportunities I’ve been given and hope that they continue to happen. I have recently booked onto the Level 3 Mat Pilates course with HFE. I’m really looking forward to studying again and learning about a completely different area of the fitness industry, I’m excited about what the future holds for my fitness career and I definitely want to learn more.